The Most Racist T-Shirt Ever… WTF?! | JIFFY FEET – Southern Fried Awesome! The Most Racist T-Shirt Ever… WTF? !, originally uploaded by jiffyfeet. Holy Shite!!! Have you ever seen a more racist T-Shirt in your life? And if it wasn’t a ridiculous enough graphic to begin with, they printed it on a Neon Green Tee. That thing looks fresh out the package. I think this guy knew that this might be the only place besides a Klan rally that he could wear this and not get beat down. I mean, talk about balls… Gawd. Props to @pointshootenjoy for capturing this spectacle of Outrageous Apparel. And If you haven’t guessed, It was Taken at the MONSTER TRUCK rally here in Jax last year, I just been holding on to it for a while. Let the Comments Fly!!! 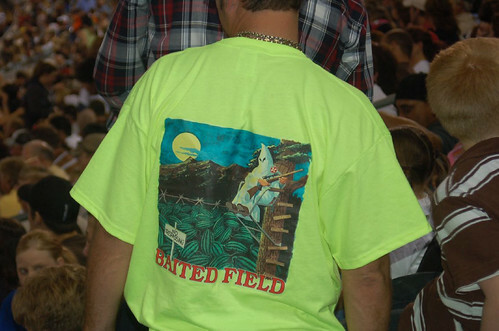 7 Comments on "The Most Racist T-Shirt Ever… WTF?!" i can’t even believe my eyes! someone please shoot this man. Un-f’ng-believable. People like this should not be allowed out in public. I hope his daughter marries Flavor Flav and his son marries Ru Paul. Haha. I remember seeing that bad boy in person. So awesome. I know! I couldn’t believe my eyes. His son was wearing a neon green tshirt too and i was like “omg, he’s turned his son into a racist billboard” but luckily the boy’s shirt was a different, non-racist design. however, i still hate it when parents impose thier own, often stupid, opinions on thier children. gaaaaaaaaaaaaaah, i hate this guy. should have punched him @ the truck show. haha. We live in Northern Florida (aka South Georgia). Does this really surprise anyone?